I love college football. My favorite team is my alma mater, West Virginia University. As I type, the Mountaineers are playing the mighty Oklahoma Sooners in the Fiesta Bowl. Why am I sitting at my computer instead of watching the game? It’s simple. I get too nervous to watch the Mountaineers play big games on television. I’m fine if I’m sitting in the stands, but I just cannot watch on television. It makes my stomach hurt. In some ways, this season was a big disappointment for the Mountaineers. We were ranked very high in the preseason polls, then lost to South Florida and dropped down in the rankings. As the season passed, teams ranked ahead of us lost, and we moved back up. Going into the last game of the season, against archrival Pitt, we were ranked #2. All we had to do was beat unrank Pitt and we would be playing for the national championship. All season, #2 had been a cursed position. Nearly every week the team holding that ranking was beaten. Alas, WVU followed suit and fell to the Pitt Panthers. It was the worst loss in WVU football history and was topped off by the coach who claimed to be devoted to the university, who pledged to be there for a long, long time, suddenly and unexpectedly resigning to accept another coaching job. All of this was disappointing, for sure, but not the end of the world. When life gives you lemons, make lemonade. Right? Let’s keep things in perspective. First of all, it’s only football. We had a great season. We shared the conference title with UConn and are playing in a BCS bowl. Our players showed a lot of character through adversity, and WVU will hire a new coach. Win or lose, I will always love my Mountaineers. Knitting is kind of like your favorite football team. There are highs and lows, adversity and triumph. Sometimes things work out great. The yarn is the perfect color, your gauge is spot on, the hand is exactly what you want, the pattern lives up to or even exceeds your expectations, the finished item fits perfectly. Sometimes things don’t go as planned. The yarn you selected isn’t quite right, so you have to search for a more suitable yarn. Your gauge is off, or you don’t like the fabric. You think to yourself, That’s why I swatch. (Unless it’s socks. I never swatch for socks. LOL) You swatch, then swatch some more, and sometimes it take a lot of swatching to get the right combination of yarn, needles, and pattern. The project might not turn out as you had originally planned, but you end up with something you like. Sometimes things go completely haywire. You run out of yarn before the item is finished and cannot find another ball anywhere. Or the darned thing just doesn’t fit right. Or the color that looked lovely in a 4 x 4 inch swatch looks ghastly in a 48-inch sweater. Or, try as you might, you just cannot face making all those freakin’ bobbles. Rip it out, rewind the yarn, and live to knit another day. Even when things don’t go as planned, I still love knitting. I didn’t like doing twined knitting. I’ll never do it again. But the socks I made using that technique are beautiful. I gave them to my mother, also a sock knitter. She loves them and wears them with pride. It was worth it to stop every 5 seconds and untwist the yarn. Okay, I exaggerate. I didn’t have to untwist that frequently, but it was still a royal pain. No more twined knitting for me. Ever. I didn’t like doing the beaded socks, either. 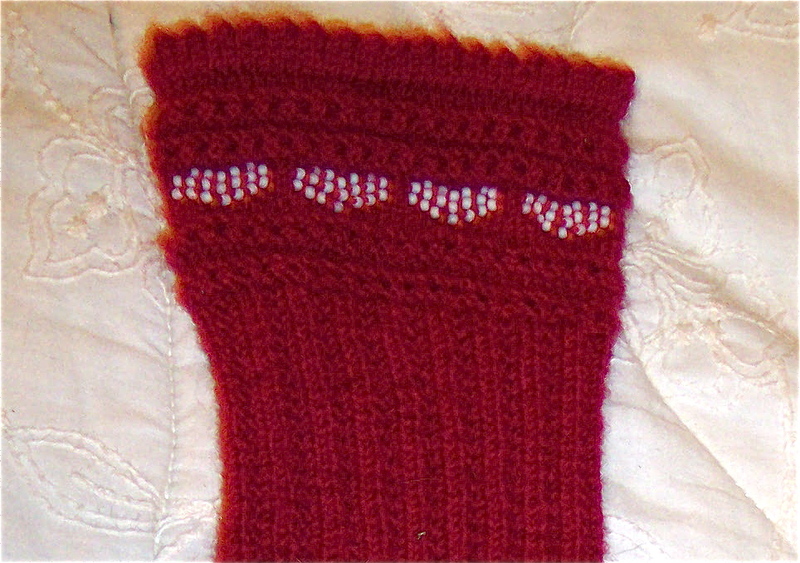 But I persevered and now have a lovely pair of red socks trimmed with hearts made of white beads. That’s one of them in the photo at the top of this entry. I know that I will never again knit with beads because I hate knitting with beads even more than I hate making bobbles. I once made an afghan that had lots and lots of bobbles. Hundreds of them. I’d rather spend the rest of my knitting life purling 3 together with laceweight yarn on 3.5mm Addi Turbos than to ever make another bobble. I’m not even watching the game and my stomach hurts.